My first real cross-country skiing experience was around my 60th birthday back in 2004 at Venabu. Since that date I have done 30 weeks of Nordic skiing, most of it at Venabu, but also including Kandersteg, Leutasch and Saariselka. 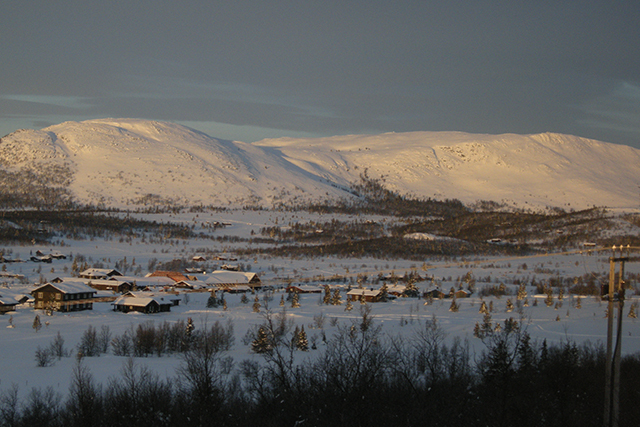 As a skier I am competent, but not expert – I still walk down the top slope off Svartfjell and I have skied into the ‘mousetrap’ on Dynjefjell and stayed upright once. Anyone who can do simple hill walking in the UK can learn and enjoy cross-country skiing, especially if starting out at Venabu with guides Robert (who has been working here since 2007) or Wenke. There is good training for beginners from very simple tracks to gentle slopes, plus a variety of hills and longer tracks for those who are competent or expert. I have seen war veterans still coming to Venabu aged 85+ who still enjoy skiing for 6–10km each day. 7am: The alarm goes off, if we’ve not already been woken up by the sun streaming in through the window. Our room has one window facing east. Gently get washed and dressed, check that ski clothes and rucksack are ready, make sure GPS and phone are charged. 8am: Breakfast – a full buffet including all the continental options. My normal breakfast is porridge, followed by egg, bacon and tomato, plus bread or rolls and preserves and three cups of tea. For the four of us who have been to Venabu several times, this is a relaxing ¾ hour because we know our kit and ski preparation will only take a few minutes. For newer visitors to Venabu it is more of a rush. 9:15am: Down to the ski stall, find skis and to final prep. This is normally just to check ski bases and to top up waxing if necessary. A clean and re-wax of skis is normally only necessary if a warm day is followed by one much colder. Putting a cold wax on top of a warm wax doesn’t work very well. Warm wax on top of cold is fine and is often done out on track if conditions change. 9:30am: All groups assemble and by 9:45am all are normally out on track. Each group is normally five to eight people and I often join one of these tours. 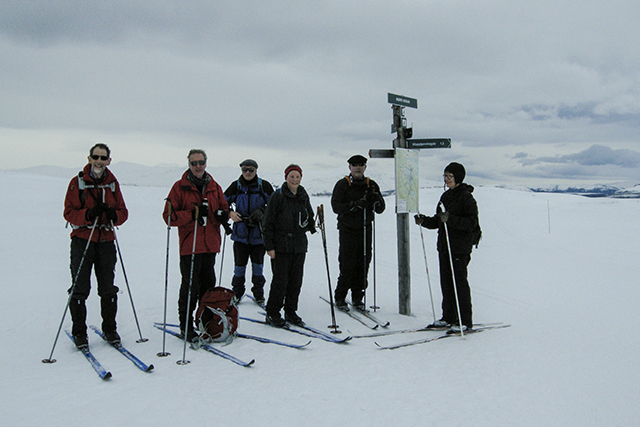 If the groups are large, we will often pick our own route and go on our own trip of three or four skiers. This is OK so long as we fill in the route book. 9:45am – 1:30pm: 12–18km ski trip, which will almost always include some hills (to get the run down again), but with stops to admire the view and have a drink. If we can get a trip with Robert (on his quieter days) this will include some off-track skiing, maybe across country from Bollia to Breflya or out towards the DNT hut at Grohogdbu and across to the canyon to admire the drop. 1:30pm: Buffet lunch – check out what the chef has prepared for today and eat three courses from the wide selection available. The fish dishes, hot and cold, are always very good. This is a time to relax and recover and to top up the water intake. 2:30pm: More relaxation in the lounge with tea or coffee plus discussion with others about trips today and plans for tomorrow. 3pm: Sometimes a short training session with Robert out on the slope to practice turning and braking techniques or a short ski trip to test skis or check if I am as fit as I would like to be. 3.30pm: Shower, 15 minutes in the hot sauna, cold shower, 10 minutes in chill room, 10 minutes hot sauna, cold shower, another five minutes in the chill room, shower and dress. 5pm: Back up to the lounge for another tea or coffee, read a book or do a puzzle. (While at Venabu we eat three good meals each day, but for the full holiday we rarely put on much weight.) This is because three to four hours’ skiing in the cold, dry Norwegian air uses up a lot of calories. Daily calorie burn is up to 4,000 calories – 1.5 to 2 times what you would use at home. 7pm: More relaxing in the lounge, with music and dancing for some. 8pm: Two or three evenings a week there will be a slideshow or talk in the Plenum room by Lars, who provides information about the area and the history of Venabu. With the advent of digital cameras there are new and different slides every year and the talk is interesting even if you have seen it several times in previous visits. 10pm: By now most people are going to bed. Our ‘Après Ski’ is quite gentle at Venabu. Why do we go for two weeks? 13 days skiing means we can afford one or even two days to build up into skiing longer trips. We don’t have to do something special every day. With only six days of skiing in one week and eight or nine major routes to try it is easy to get rushed into trying too much. With 13 days skiing in two weeks we can fit most things in. One lost day due to poor weather is not a problem so a lazy day can be allowed. 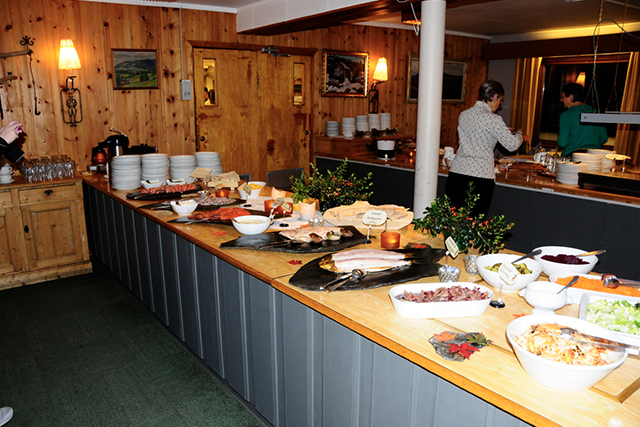 We get to enjoy the Norwegian buffet twice – a meal not to be missed. I am getting to the idea that two weeks is not enough, it might be three weeks next year! On your first night the chief guide and organiser, Robert, gives an introductory talk to all newcomers and issues boots and skis. The following morning you’ll receive a demonstration on how to wax your skis and you will do this under the supervision of the guide with the rest of the group. The newcomers are divided into two groups, ‘beginners’ and ‘improvers’, for short and intermediate tours. Most of the beginners make it round at least one of the hills by the end of the week (including my trip round IndreUksan in 2004) and a lot of them come back again and again because of the fantastic guides, good variety of tracks, reliable snow and good food. 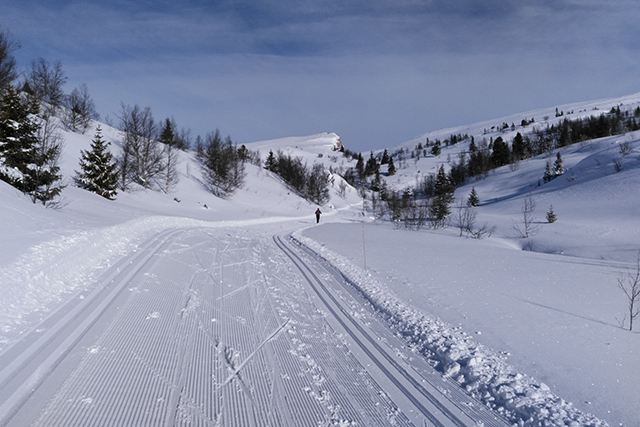 Top tip: It is important to remember that the alpine, downhill skiing technique does not immediately translate to Nordic cross-country skiing because of the different equipment and different skills required. Coming up next week – Chris shares his shopping list of what to pack for your cross-country skiing trip. Chris is a competent skier who has been enjoying trips to Venabu with Headwater since 2004.